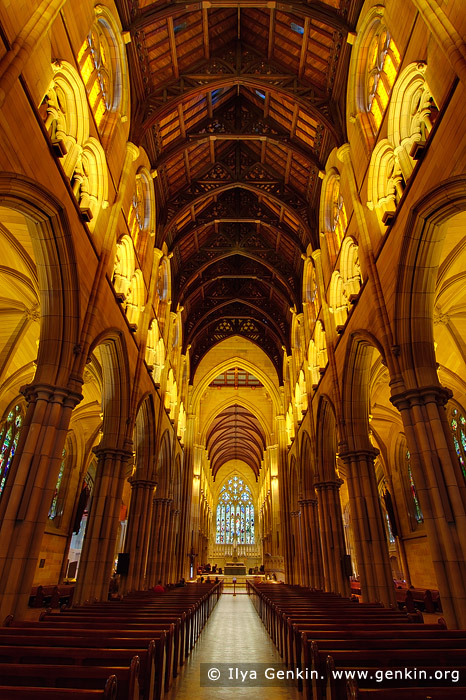 In cross-section the St. Mary's Cathedral in Sydney, NSW, Australia is typical of most large churches in having a high central nave and an aisle on either side, which serve to buttress the nave and provide passage around the interior. The interior of the nave thus rises in three stages, the arcade, the gallery and the clerestory which has windows to light the nave. The building is of golden-coloured sandstone which has weathered externally to golden-brown. The roof is of red cedar, that of the nave being of an open arch-braced construction enlivened by decorative pierced carvings. The chancel is vaulted with timber, which was probably intended to be richly decorated in red, blue and gold after the manner of the wooden roof at Peterborough, but this did not eventuate, and the warm colour of the timber contrasts well with the stonework. This image belongs to the travel and nature stock photo library. This stock photo of St. Mary's Cathedral is available for licensing for commercial and editorial uses including websites, blogs, books, magazines, brochures and advertising. Restrictions may apply for images which contain third party copyrighted material or sensitive subjects. Photos of artwork are for editorial use only. This image id AU-SYDNEY-ST-MARYS-CATHEDRAL-0002 of St. Mary's Cathedral, is copyrighted © by Ilya Genkin. This is not a public domain image.